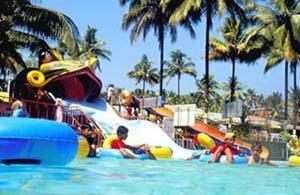 Dream World Water Park is located near Athirappilly waterfalls in a place called Chalakudy of Thrissur district. It is a modern man made sophisticated water park and is situated close to the enchanting Athirappilly waterfalls which is a sought after tourist destination in Kerala. The excitement begins right from the entrance when one sees the huge dragons built at the main gate to welcome its visitors. The park offers many thrilling rides suitable for people of all age groups. Another feature of Dream World Water Park is that it has been designed in such a way that it does not create troubles for the visitors, be it kids or elderly people, relieving them of the hassles of too much walking and climbing. The floor area of the entire park is filled with lawns and paving tiles that enable the visitors to walk barefoot if needed without causing much hurt. This is a unique feature of this park which is usually not seen in any of the other amusement parks. This park has its share of few unique rides which cannot be found in any other park in South India. The park offers both dry rides as well as water rides. Out of the 42 rides at the park, 24 of them are water rides and the remaining 18 are dry rides. Though some of the rides seem like common ordinary rides, they have been made unique in their own way by using different kinds of seating e.g Single, Double, Triple, Five-seated etc. The park also takes immense measures to ensure that the water used in the rides and pools are regularly cleaned, purified and hygienic. Dream World Water park owns some of the modern filtration plants for this purpose. 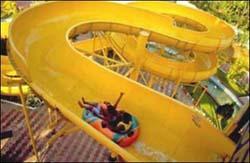 One of the attractions of Dream World Water park is the Rain Dance which is now found in many other amusement parks but was first introduced in Kerala by Dream World. In Rain Dance, people of all ages can dance in the water with colourful lights, snow showers and blasting music. It is a very entertaining area for teenagers mainly. There is a separate pool called Mermaid Pool which is meant only for ladies and children which is divided into three parts of different depths. Some of the water rides offered by Dream World Water Park include Stormy river, Amazone river, Lazy river, Mat racer, Wave pool, Rain Dance, Dream Splash, Crazy cruise, Space Bowl, Mermaid pool, Dream Shower, Infant pool, Aqua shuttle and Boomerang. Some of the dry rides offered by Dream World Water Park include Dragon Train, Dynamo Hockey, Computer games, Striking car, Flying Columbus, Crescent Coaster, Caterpillar, Family Swing, Revolving Barrel, Kids Multi Games and Twister. Some of the facilities provided by Dream World Park includes free accommodation (for school students and staff with dinner), clean prayer halls, changing rooms, locker facility, toilets, cloak room, sale counter for garments, telephone booths, high class restaurants, doctor's clinic, rest room, wheel chairs, conference halls, food courts, ice cream parlours, stalls selling fancy items, parking area and television sets in the pavilions of the Wave pool and at the restaurants. Special discounts are given to school groups, college institutions and families coming in large groups.